Time is up. The votes have been counted. The results are in. With less than 24 hours to go until the end of the year, a small perl script has informed us who has won this year's Best of 2007 awards. The chosen few, selected by drobe.co.uk readers, should come as no surprise to anyone closely following the RISC OS news scene over the past 12 months. Without giving too much away before unveiling the winners, it appears RISC OS users, or at least those who read Drobe and voted on the shortlist, hold their graphics software in high esteem. Applications involving the Internet also proved popular, and a particular operating system development was a hit with voters. Winner: ArtWorks 2.7. Top new features for this vector graphics package included support for documents with multiple pages and multi-page PDF export. Runners-up: Messenger Pro 5 and the TechWriter/EasiWriter family. Winner: NetSurf. This year saw the release of version 1.0 and 1.1 of the open source web browser. Winner: The joint Castle-RISC OS Open shared source project. In 2007, the RISC OS 5 shared source licence was unveiled, source code and binaries were released for download, and third-party developers started feeding much needed updates back into the operating system. Runner-up: Paul Stewart's A9home-in-a-flight-case portable computer. Winner: There was no outright winner as the large majority of readers who voted plumped for the 'Can't decide' option in this category. Runner-up: The Wakefield 2007 show. Congratulations to the winners, a nod of recognition to the other nominees, a big thank you to everyone who voted, and a pat on the back for anyone who contributed to the RISC OS platform this year. 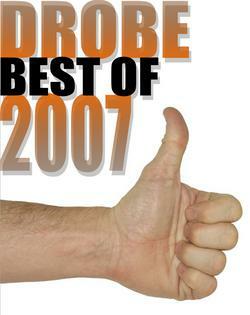 Let us know if you have any predictions for 2008, and have a happy new year. Well done to the Netsurf developers. As I told you at Wakefield, You guys rock. Yay! While I of course hold more congratulations for NetSurf, we should pay tribute to all the nominee's efforts this year. Well done to all the winners, and a well done to all those nominated as well. Maybe there should be a best 'newcomer' award for new piece of software, idea, etc. Perhaps next year the time line to nominate could be longer and suggestions for categories would be nice. I do miss the "what went wrong" and the "best contributor" this time. The freebie category was much more difficult - I rely on !PrivateEye to manage my image collections, and !Parmesan is always running. But in the end I had to vote for NetSurf. Without it I don't think that RISC OS would survive. I like the suggestion of 'best newcomer'. Sadly the awards this year were not as fulsome as last year's simply because we ran out of free time over the Christmas period. I don't want to sound like a broken record or making excuses, but we need contributors to drobe.co.uk more than ever before. Reviews, comment pieces, news, anything. Just drop us an email. Our articles enjoy thousands of page views and you could have your name on them. A big thank you to everyone who made it onto the front page over the past 12 months. Well done, all my choices won. Drobe: don't have a "can't decide" option, force people to make their minds up! In reply to druck: Sorry, to disagree - for the shows that "can't decide" is welcome since I didn't visit any of the shows and from just the show reports it is not easy to select - especially with so little time to decide. Or simply put, if I'm forced to select one choice of each category and for one I can't do so I'd either roll the dice or simply not vote at all. hzn: fair point, so then lets not count the can't decides, treat it as a void vote in that category. in reply to druck: 'Can't decides' might better be allocated as fractional votes equally amongst all the options, so one-third of a vote each to three contenders, or a quarter of a vote amongst four, etc. In this way, a general consensus that there was no clear winner from amongst several equally worthy contenders would be fairly reflected. In reply to druck: The can't decides should be counted! What if 90% say that and the other few decide. Ignoring 90% is not a sensible option I think. hzn: Rubbish! If people can't decide they don't get counted. Practically every vote or election is decided by the minority of the eligible electorate that has made the effort to register their prefences. In future years the "can't decide" should be replaced with a "not voting in this category".